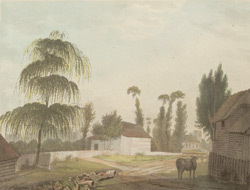 View of Morden village as it was in the late 18th century. Then it was still a scattered settlement south of Merton village in Surrey. However it got caught up the suburban sprawl of 19th century London and now it is part of London. In the distance is St Lawrence's parish church which is located along the London Road. Nearby there were several country estates, Morden Hall on the site of the old manor house and Morden Park with its 18th century house.